Author Anthony Doerr explains why he feels at home in Boise. 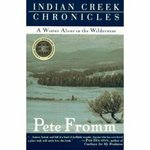 Indian Creek Chronicles is Peter Fromm’s account of seven winter months spent in Idaho’s Selway-Bitterroot Wilderness. Only nineteen at the time, Fromm left college to tend “two million salmon eggs planted in a channel between the Selway and Indian Creek” for the Idaho Department of Fish and Game. With his dog, Boone, as his only companion, the nearest road 40 miles away, and winter access only by snowmobile, Fromm, “a tenderfoot” at the beginning, describes the challenges of self-sufficiency and survival. A winner of the Pacific Northwest Booksellers Association Book Award, Indian Creek Chronicles combines a strong sense of place with absorbing adventure. Rediscovered Bookshop, in Boise, Idaho, is profiled this week on the American Booksellers Association website. The American Booksellers Association visits Idaho's Iconoclast Books. Lloyd and Momoko Fuller are at the center of All Over Creation. Their neighbors, Cass and Will, have been caring for them in their declining health, allowing them to remain in their farmhouse even after buying "up the last of Fuller's acres." The Fullers' daughter, Yumi, her three children in tow, has arrived home for the first time in more than twenty years, summoned by Cass, her childhood friend. A group of activists, known as the Seeds of Resistance -- Melvin, Lilith, Geek, Charmey, Frankie -- have also found their way to the Fuller farm. They are on a pilgrimage to meet the people behind Fullers' Seeds. And there are those out to stop "the Seeds", fearful of anyone who could impact the potential profits from genetically engineered food, including Elliot, a lover from Yumi's past and the reason she ran away from home. All these characters move the reader through the book's many themes, including those of friendship, parenting, infertility, aging, love, caregiving, death, and forgiveness, but, perhaps, it is the questioning of genetically engineered food that stands out, that remains in readers' minds long after the book is finished. Lloyd and Momoko Fuller began their lives together as potato farmers. During the years while Lloyd was expanding his "monoculture," becoming wealthy in the process, his wife, Momoko, was nurturing seeds, "open pollinating" them. When Lloyd's health begins to decline, he is drawn to his wife's endeavor. Together, they sell these seeds, encouraging their customers "to grow and save and multiply as you choose...."
The Seeds of Resistance are moving across the country, staging demonstrations against genetically engineered food, reminding any Edward Abbey reader of his "Monkey Wrench Gang". They drive a vehicle named "Spudnik", bio-fueled by cooking oil "pilfered" from fast food restaurants. The Seeds stage demonstrations as they travel, stopping at supermarkets to protest and educate. They have that Abbey combination of humor and seriousness -- imagine the characters dressed as a cow or a potato explaining to customers about the problems with genetically engineered food. They are gentle folk with a cause. When they see a flyer from Fullers' Seeds, they decide to travel to Power County, Idaho, to meet the Fullers. They think of Lloyd as their "guru" and, as his health deteriorates, they help care for him and the precious seeds. As the characters struggle to find ways to reconcile their pasts with the present and as tragedy occurs, readers are tugged by emotion. But, All Over Creation, also tugs at our brains, encouraging us to think about what we want to eat and how we want it grown. We realize that the novel could take place anywhere. It isn't just the potato farmers of Power County, Idaho, who must make decisions about how to farm. And, as the characters prove in All Over Creation, everyone has a stake in what we consume. It is an issue that can reach beyond spiritual and political differences.